Digital LED strips are sometimes also sold as Magic or Dream LED strips. Using digital LED Strips you can create advanced light effects. Thanks to the individually controlled LEDs it is possible to create spectacular light effects such as rainbow, chasing lights and much more. On our website you will also find controllers that you can program yourself. You can use these controllers to create your own light programs! You can also connect digital LED strips to your own controller. 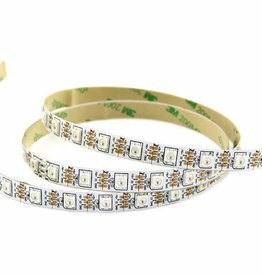 Our digital LED strips use the IC 1903, which is the most typical type of digital LED strip IC. 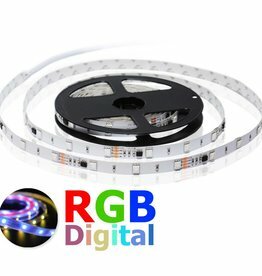 High quality digital IC1903 flexible LED strip with 60 LEDs per meter. Each LED is individually addressable, giving this LED strip a very high resolution of 60 pixels/m! Digital LED strips have a variety of special applications, the most simple of which are chasing lights or rainbow. However, it is also possible to place many LED strips side by side to create a matrix of LEDs. You can project graphics or video on such a matrix. For such applications you will need a special digital controller with software (Please see Accessories > Digital LED strip controllers for this). Using this controller, it is possible to define where exactly each LED strip is placed, and then graphics or video can be projected over the array of LED strips.